A simple and easy to use app to be used as a discipline aid for young children. Instantly phone Santa Claus and have a conversation with him regarding either a naughty or a nice child. 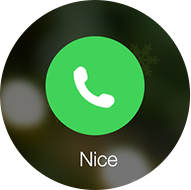 Santa will politely encourage "Naughty" children to be good in time for Christmas, or reinforce good behaviour in "Nice" children - all over the phone!. Whether your little one is being naughty or nice in the lead up to Christmas, Call Santa Christmas app has tailored scripts to suit all scenarios. 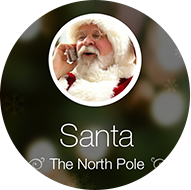 Create some Christmas magic using Call Santa app's realistic phone call interface to give the impression that your loved one really is talking to Santa Claus! 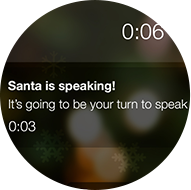 The app allows you to read the phone call script in advance, and with pauses that allow you to communicate with Santa. Call Santa app's script prompts also let you know which line is coming up next. What are you waiting for? Call Santa!